Merrill Gardens at Rancho Cucamonga Goes Vertical! July marked a big month of structural concrete foundation and concrete slab on grade work. 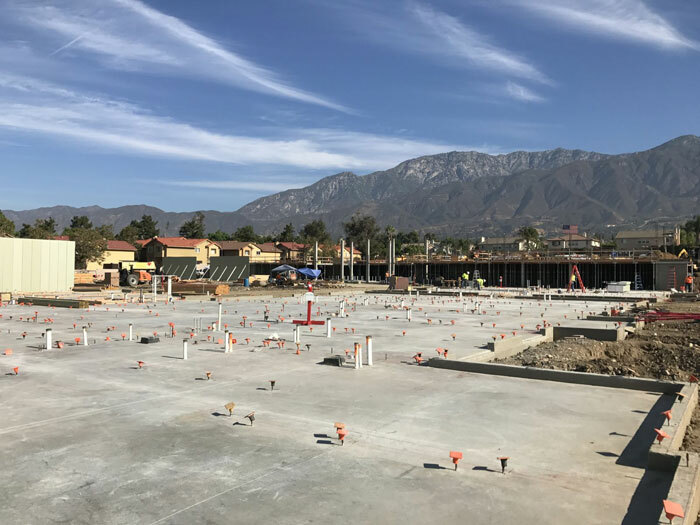 Over the past 4 weeks, the Merrill Gardens at Rancho Cucamonga project placed roughly 55,000 square feet of concrete slab on grade on our Plaza Level and we are now ready to GO VERTICAL! Currently, our crews are shoring and decking our first elevated post tensioned concrete deck which will pour in mid-August. Production wood framing is ready to hit stride in August with walls on the Plaza Level, Level 1 floor joists and roof trusses. Site underground wet utilities is nearing completion which will open up the runway for our site underground dry utility work. Our team is pleased with the progress through July and is excited to charge forward with vertical concrete and framing work in August and throughout September!